The famed crime author says the Hernandez case is "the most dramatic and surprising murder mystery in the last 25 years." The troubling, tragic story of former NFL star Aaron Hernandez seemed to be one that would eventually get the movie or TV treatment. That process appears to be now be underway. According to The Hollywood Reporter‘s Borys Kit, James Patterson’s upcoming book on Hernandez, titled American Murder: The Rise and Fall of Aaron Hernandez, the Superstar Whose Life Ended on Murderer’s Row, has had its movie rights acquired by The Mark Gordon Co., which has produced several prominent feature films, including Saving Private Ryan, Speed and the recent remake of Murder on the Orient Express. Patterson’s book will be released this coming Tuesday, Jan. 23. In 2015, Hernandez was sentenced to life in prison without parole for the murder of Odin Lloyd. He was later acquitted of a double murder with which he was implicated. 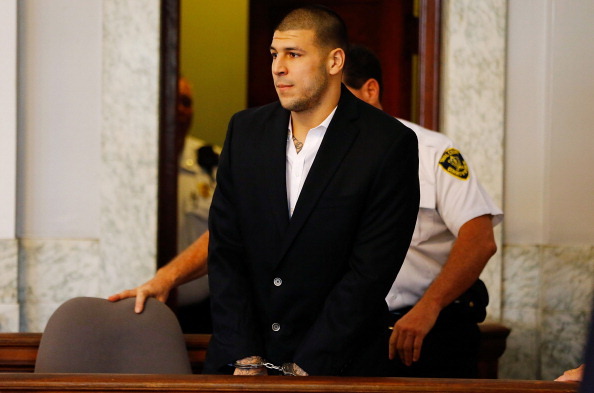 Just 27 years old, the former New England Patriots tight end hung himself in his prison cell last April. Patterson, author of the popular Alex Cross crime thriller novels (of which Hernandez was apparently a fan), conducted more than 60 interviews for the book. To no surprise, New England Patriots coach Bill Belichick declined to be one of them. Patterson said in an interview for CBS’ 48 Hours that he doesn’t typically write non-fiction, but was fascinated by the Hernandez case. CBS aired a one-hour special about the Hernandez case and Patterson’s book Saturday night, which is available to watch online. The special includes interviews with NFL Network reporter Ian Rapoport, Urban Meyer (who coached Hernandez at the University of Florida), and Dr. Bennet Omalu, the doctor who discovered the degenerative brain disease CTE. A severe case of the disorder was discovered in Hernandez’s brain, post-mortem. With the popularity of true crime miniseries such as FX’s The Assassination of Gianni Versace and The People vs. O.J. Simpson, Discovery’s Manhunt: Unabomber and Paramount Network’s upcoming Waco, the Hernandez story seems like it might be suited to a longer format, rather than a movie. But perhaps there’s not enough material from the case overall for that kind of longform treatment.